All In One cloth diapers are available in many designs for baby girls, boys and gender neutral. It’s a great baby shower gift for any parent who is interested in cloth diapering. Easy to use, AIO cloth diaper is perfect stash starter for newbie, daycare and busy family. Unique design is a hybrid of the AIO cloth diaper and Pocket cloth diaper. 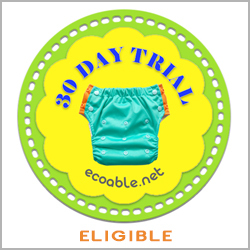 Cloth diaper shell has sewn-in insert for absorbency, so you don’t have to stuff with doublers for day-time use. Pocket opening gives an option to add more inserts for overnight use. Compatible with EcoAble bamboo and hemp inserts (sold separately). Inside of the AIO diaper is lined with stain resistant charcoal bamboo material. Charcoal bamboo naturally provides stay dry sensation; your baby will feel dry and comfortable even when the diaper is soaked. One size cloth diaper is adjusted with snap buttons to fit Small, Medium or Large size. Adjustable cloth diaper fits babies from 10 to 35 pounds. Truly grows with your child from infant days to toddler-hood. Tested and certified in compliance with the US CPSIA (Consumer Product Safety Information Act) rules and regulations.